Did you know that there was a vehicle segment called ‘B SUV’? It is of course a small misnomer, as really something as small as a Clio (actual B segment) can’t have an SUV cousin in the true sense of the term SUV. These are more crossovers than anything, of course. Anyway so this is the new Renault Captur. It’s based on the Clio platform, however Renault are quick to point out that this is more than a Clio ‘Stepway’. Instead it’s positioned as a blend of hatchback, MPV and SUV – which is the exact definition of crossover I might add. The SUV blend comes about thanks to 170mm of ground clearance, 50mm more than the Clio. There are a few other nice touches, like removable and machine washable zip seat covers. Clever, right? As for the MPV bit the Captur’s boot has a clever hidden floor, giving you the option of storing valuables below it, or alternately removing the floor to open up even more luggage space. Furthermore the rear seat bench can slide forward some 16cm, opening up the boot to a cavernous – and class leading – 455 litres. 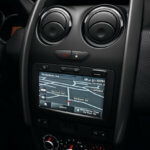 The Captur also boasts an impressive features list, including things like Bluetooth, automatic headlights, rain sensing wipers, Renault’s MediaNav system, park distance control and a fetching two tone paint job. Has a 5 star EuroNCAP safety rating too. So enough of all the bits and bobs. What’s the Captur like to drive? And the answer is very nice indeed. It boasts the now well established 88kW 1.2-litre turbocharged power unit that’s mated to a six-speed manual gearbox, although an auto is available too. In fact the EDC gearbox, as the auto is known, is a smooth as you’d like and there’s just about enough go from the little turbo motor to make the combination quite pleasant. The cabin is very well appointed and feels solidly built. The 170mm ground clearance means you can barrel along dirt roads without worry of bumping important bits underneath the vehicle – and the suspension just soaks up anything you throw at it with ease. There’s little to dislike here. The Captur is a well placed proposition for anyone currently looking to buy a compact crossover, if for no other reason than the Renault offers great value for money. The nice thing is there are lots of other reasons too. But what if you really do want a fully fledged, but small, SUV. Well Renault have just the thing. It’s called the Duster and this one does indeed meet all the criteria. First off its proper rugged. 210mm of ground clearance puts the Renault high up, if you’ll excuse the pun, on the list of compact SUVs. A must have for SUV status is the option of a proper 4×4 system, and while we didn’t drive that one on this occasion, it is a very capable offroader indeed. Short overhangs and an off-roader appearance drive home the look. But rugged isn’t all the Duster can muster. On the inside it’s a well equipped vehicle with most of the bells and whistles the Captur features, like sat-nav, Bluetooth, rear camera, cruise control…and so the list goes on. Space wise it’s a bit roomier than the Captur, but overall less flashy. More down to earth is the best description. Powering the 4×2 Duster we drove is a 1.5 turbo diesel unit from Nissan (which can also be had in the Captur). It’s a peach of a motor, frugal, punchy and solid as a rock. Just what any good SUV needs. And it now also has that EDC auto gearbox that the Captur offers, which as mentioned is a smooth operator indeed. So then, what the Renault offering comes down to is whether you’re in need of an SUV, or merely want an elevated driving position and bit of MPV practicality. 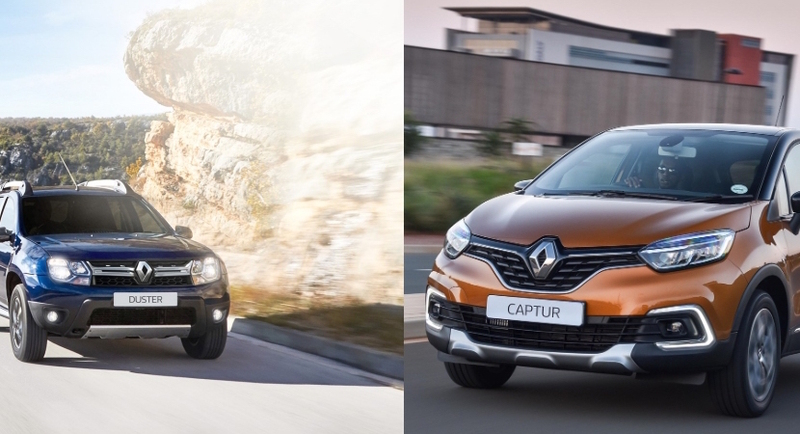 Fortunately, either the Duster or Captur will serve you exceptionally well in their respective market segments.